Raprima Tempeh Starter ( Contains Rhizopus Oligosporus , rice powder) 1500 Grams. (3 bags @ 500 Grams). Most economical, same registered mail shipping costs as 2 bags ! Minimum Order is 1 Kg ! We can offer Sea freight, but knowing that Raprima will lose 20 percent of its potency during the months long trip, which most sellers do not mention. 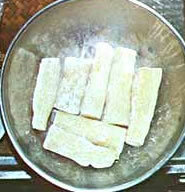 One kg of dry soybeans prepared as directed will make 1.5 kg fresh tempeh. Preparation time is less than 2 hours. Incubation time is about 24 hours at 85 F - 89 F (32 C). Raprima tempeh starter is for the serious Tempeh makers, comes in factory sealed bags, with exp date, and batch numbers, contains rice powder, as media, and Rhizopus Oligosporus spores, made by Raprima, a welknown commercial tempeh inoculum starter producer from Bandung, Java. This Raprima Tempeh Starter Kit can produce 1350 Lbs. tempeh from beans, with 2 grams of starter, accordantly to the producer each 500 grams could make 450 Lbs fresh tempeh per package. 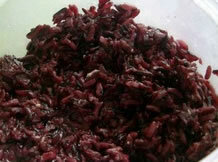 Tape Starter ( Black Rice Glutinous Tape Starter) 20 Gr.